Hibernate is a solution for object relational mapping and a persistence management solution or persistence layer. This is probably not understandable for anybody learning Hibernate. What you can imagine is probably that you have your application with some functions (business logic) and you want to save data in a database. Using Java, the business logic normally works with objects of different class types. Your application is object-oriented. Your database tables are not object oriented but relational. The basic idea of object relation mapping - ORM is to map database tables to a class. One row of the database data is copied to a class instance. On the other hand, if an object is saved, one row is inserted in the database table. Saving data to a storage is called persistence. The process of copying of table rows to objects and vice versa is called object relational mapping. As it is easier to explain something after having shown a real example, we will develop our first Hibernate application now. Our use case is sweet. We will use an example from the honey production. You need a lot of bees to get honey. Our use case includes Honey and Bee as model and a 1:n relation from Bee to Honey. Using object oriented terms: There is a 1:n association between the class Bee and Honey. We will create a class Honey which is mapped to the table honey in the database and a class Bee mapped to the table bee. The following picture shows our database schema. For this example you will find the complete source code in the ebook. Normally, I show only the relevant part of the source code in the ebook. But you can find the complete source code in the provided sources. Create a new project using your development environment. I used Eclipse for this example. Using Eclipse press the keys Ctrl+n (Strg+n) to create a new project. Select Java project. We will call it FirstHibernateExample. Getter and setter methods for our fields. In eclipse you can generate them (Context menu → Source → Generate Getter and Setter). Overwrite the toString method. We will need it for debugging. Java version: I used Java generics, which was introduced with Version 5 (alias 1.5). Annotations always starts with @. return "Honey: " + getId() + " Name: " + getName() + " Taste: "
A default constructor (= no parameter) with at least protected scope. Either omit the constructor or create an empty one. Implementation of the Serializable interface, if and only if you want to serialize your entity. This may happen indirectly if you put an entity for example into a HTTPSession. Hibernate does not require the Serializable interface in entities. The field id is once again the primary key. Please don’t forget the important requirements, I stated above. classes or XML mapping files holding our mappings. Create a new file named hibernate.cfg.xml in your src directory. You have to choices to map documents: Annotations and XML. They’ll be discussed later in this book. I explain both approaches for this example. If you can use Java 1.5 alias 5 or later, I recommend to use annotations. Below you can find a configuration for PostgreSQL using annotation based mapping. Afterwards, I will explain required changes for other databases and XML based mapping. Do not forget to change the username and the password to suit your database configuration. At the beginning of the configuration, you can find the database connection. Afterwards, the dialect is specified. Hibernate will translate all queries into this dialect. Then, I configured the cache implementation and the session and transaction behaviour. The setting hbm2ddl.auto instructs Hibernate to update or create the table schema when the configuration is initialized. You only have to create the database. If you want to use another database, you must find out the name of the driver class and the name of the dialect. You can find all available dialects in the java package org.hibernate.dialect of the hibernate.jar file. The connection.url is a normal JDBC connection URL. An annotation always starts with an @. You just have to add annotations to your java file. Annotations must be imported just like other classes. The annotation @Entity defines that our class is a mapped class. The primary key is defined by the @Id annotations. It is generated by Hibernate using a database sequence. It is defined with @SequenceGenerator before it is used by the id (@GeneratedValue). The annotation @OneToMany describes that the field bees is a 1:n association to the class Bee. The foreign key is defined in the class Bee. Therefore, we have to add the parameter mappedBy. The class Bee uses two other annotations. @ManyToOne describes the association/relation from class Bee to Honey. With the annotation @JoinColumn we configure that the table bee contains a foreign key column. We did not specify a column name, so Hibernate will choose honey_id. This selects a generator depending on the configured database dialect. You only need the XML mapping files, if you don’t use annotations. In the mapping file the mapping from our class Honey to the database table honey is configured. Create a file Honey.hbm.xml in the package de.laliluna.example. The tag <id> specifies the primary key and how it is generated. Normal fields are mapped to a column using the <property> tag. If we didn’t specify a column name (column=”xyz”), than Hibernate would have chosen the name of the field as default column name. <set> describes the relation to the class Bee. This will choose a generator depending on your database dialect. Why using type=”string” and not type=”java.lang.String”? The Hibernate type can be more precise than the java types. A database field like date, timestamp, time is always handled by a java.util.Date. When you define a type as java.util.Date Hibernate does not know which kind of database type to choose when it generates tables. This is why I use Hibernate types in general. In most cases you don’t need to set the type. Hibernate will guess the column type from the Java class. To use Hibernate, we need a couple of libraries, alias JAR files. In the sample projects, I have used Maven dependencies. If you know Maven, just copy the POM from the source code and use it. I have declared all dependencies in a parent pom.xml, which is in the root of the workspace. in a shell. Alternatively, you can choose a run task from within Eclipse as well by right-clicking on a pom.xml and choosing "Run…"
If you want to add the libraries manually, here is a list of required libraries and versions. 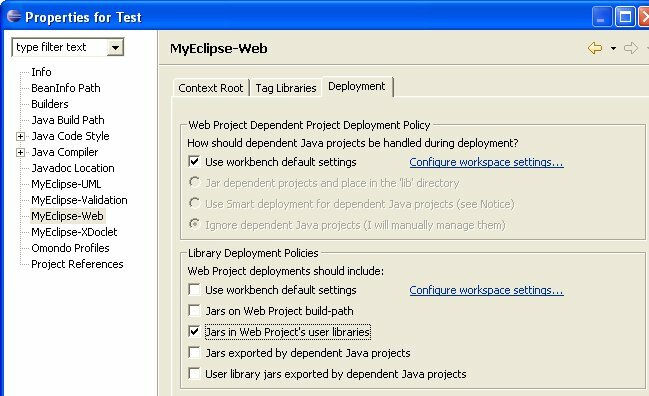 In Eclipse Open your project properties, select “Java Build Path”, click on “Add External Jars” and add at least the libraries shown below to your project path. Included in the Hibernate Core Download. Some projects use caching and Hibernate validation. Included in Hibernate Core, Hibernate Validator and Ehcache Download. We need a database driver as well. Find the appropriate JDBC Driver for your database and add it to the project libraries. I used PostgreSQL. You can get the driver from http://jdbc.postgresql.org/ . You can use the JDBC 3 driver if you are running a current j2sdk like 1.4 and 1.5/5.0. A session factory is important for Hibernate. As the name already indicates, it creates Hibernate sessions for you. A session is all you need to access a database using Hibernate. In addition, a session factory initialises your Hibernate configuration. Create a class named InitSessionFactory in the package de.laliluna.hibernate and add the source code below. This class guaranties that there is only once instance (Singleton pattern) and that the initialisation happens only once when the class is loaded. Hibernate uses log4j as logging output. As you can see above we added the log4j library. This library needs a configuration file in the source directory or it welcomes you with the following error. log4j:WARN No appenders could be found for logger (TestClient). Create a file named log4j.properties in the root directory. We will configure a simple logging output in the Console. Create a database with MySql or PostgreSQL or anything you like. Call it firsthibernate. This is the same database name, we used in the hibernate.cfg.xml. We have defined in hibernate.cfg.xml that the tables should be recreated each time when the Hibernate configuration is initialized. The setting create will drop and create any tables. It is only suitable during development. You might use update as well. 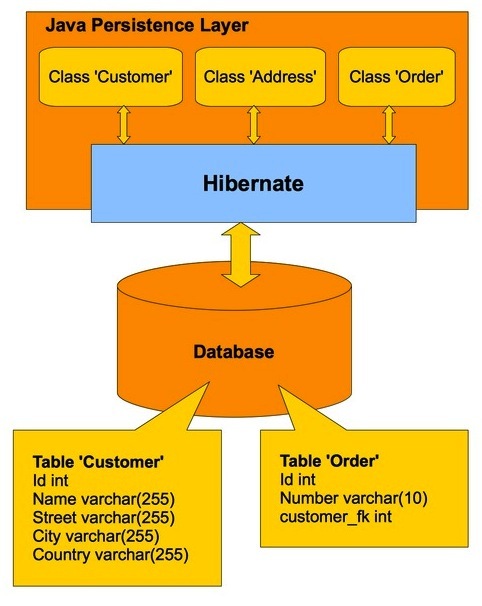 In this case Hibernate tries to update existing tables or create missing tables. This works in most cases but not always. Therefore, I recommend to disable this for production. We will create a Java class, which will create, update, delete and query our data. Create a Java Class TestExample in the package de.laliluna.example. when a transaction fails you should role back your transaction (see the discussion below as well). In this first example, we will skip the exception handling. In the main method we call other methods creating, updating, deleting and querying data. The method createHoney creates a new object and saves it in the database by calling session.save. The method update creates a new object using our last method, changes the name and updates the object using session.update. The method delete creates an object and deletes it by calling session.delete. The tables are emptied with the method clean. The method session.createQuery creates a new query and runs it by calling executeUpdate. The method createRelation shows, how to create objects and set an association between these objects. This will write a foreign key relation to the database. The method query shows how to query all honeys in the database. The call to session.createQuery creates the query and list() runs the query and returns a list of Honey objects. This was a fast example and it is not required to have understood anything. You should be aware, that in case of an exception, some databases keep resources open, if you do not rollback or commit a transaction. I will speak about transaction handling in detail in chapter Session handling and Transactions Chapter 13, Session and Transaction Handling. If you try to use the code by a JSP and deploy it to JBoss or deploy any of the later examples to Jboss you might encounter problems. The reason is that Jboss provides already Hibernate libraries and a configuration which conflicts with the Session configuration, I chose for the examples. Either use a servlet engine like Jetty or Tomcat or have a look in chapter Session handling and Transactions Chapter 13, Session and Transaction Handling explaining how to configure Hibernate in JTA environments. MyEclipse is a plugin provided by Genuitec on http://www.myeclipseide.com/ . I use it for development of all kinds of Web applications including Hibernate, EJB 2 and EJB3. MyEclipse is very up-do-date with the support of current versions of web frameworks, EJB and of course Hibernate. Create a webproject first and open the context menu of the project (click with right mouse button on the project in the package view). Select add Hibernate capabilities. The wizard let you select the Hibernate version and add the needed libraries to your project. I recommend to add the libraries to the build path and not to copy them to the lib folder of the application. This will allow to set up different configurations for deployment during development and staging. To stage your finished application you should pack all the libraries with your project. 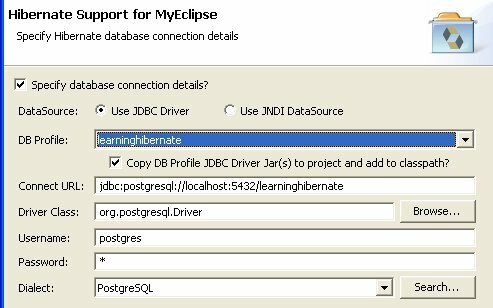 You can configure in the project properties to deploy user libraries like the MyEclipse library in your application server. During development, I prefer to copy all the Hibernate and Struts libraries to the shared library directory of the application server. 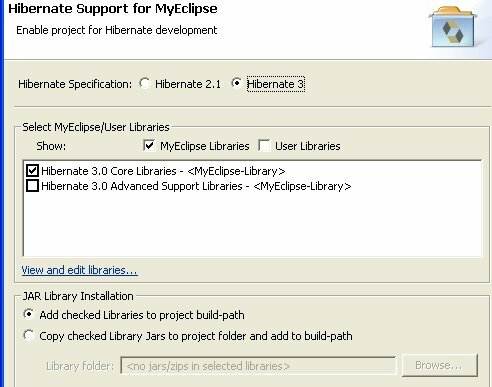 I configure the MyEclipse configuration in the project properties to not deploy any user libraries. This makes redeployment very fast. Lets continue with the wizard. You can select an existing Hibernate configuration file hibernate.cfg.xml or you can create a new one. Then you can select a database connection profile for a JDBC connection or select a JNDI datasource. A connection profile is the complete configuration of a JDBC database with connection string, user name, password and DB driver. A connection profile can be used for the database browser as well to see tables, triggers, columns. 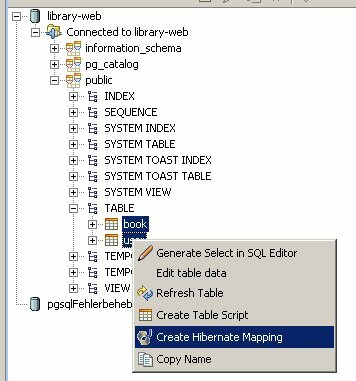 The database browser allows to generate Hibernate mappings from existing tables as well. Finally you can create a session factory. I prefer to use my own session factory as it is simpler but the MyEclipse session factory works perfectly, as well. 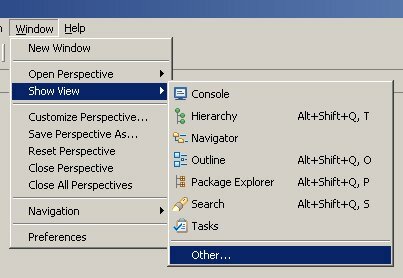 Open the View DB Browser (MyEclipse). 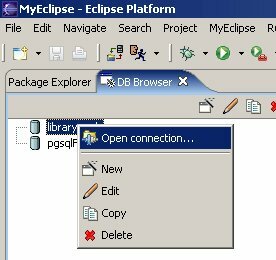 If you cannot find it open the „Show View“ Dialog and select in the MyEclipse Enterprise Workbench the DB Browser. Open the connection profile you specified before. Select the two tables we have just created. Right click and choose Create Hibernate Mapping. Follow the wizard to select where to create the mapping files and classes. You can even generate DAOs.